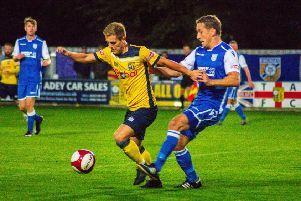 Si Collins said he was at a loss as to how Tadcaster Albion managed to lose Saturday's Evo-Stik East clash at Gresley. A whole host of missed chances, combined with two penalties from the boot of Martyn Smyth saw the hosts emerge triumphant by a 2-1 scoreline and condemned the Brewers to back-to-back losses. "I really don't know [how we didn't win], it was a really weird game," Taddy's assistant boss Collins reflected. "We've started okay, conceded a dubious penalty and gone 1-0 down but even so we're still doing some good stuff, working hard and putting a shift in. "We've changed it at half-time to give us more of a chance going forward and created so many chances in the second half. "Not just half-chances, they were clear-cut. "When we're pushing to get back in the game and get the win we've made a mistake at the other end and ended up conceding a second goal, then the goal we've scored was too little too late." On a difficult playing surface at Moat Park, the home fans were encouraged in the early stages as Smyth sent a looping header narrowly over the top of Michael Ingham’s goal. Nevertheless, the one big chance of the first half came at the other end on 16 minutes. Pete Davidson set Joe Lumsden in on goal down the right-hand side but his cross-shot couldn’t be turned home by Casey Stewart. Albion enjoyed the majority of the territory as the first period ticked by but weren’t troubling Jack Livesey in the Gresley goal and it was to be the hosts who went into the break ahead. Billy Whitehouse was adjudged to have controlled a cross with his arm inside the box and after a huge appeal from the home fans, referee Mr Dawson pointed to the spot before Smyth converted. That man Smyth almost heaped further pain on the Brewers before the half drew to a close but his poked effort whistled just wide of the top corner. 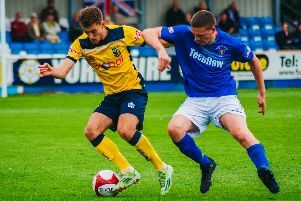 Tadcaster flew out of the blocks after the resumption but Corey Roper's drilled ball across the box evaded three waiting yellow shirts with the goal gaping. The clearest opportunity of the afternoon then fell to Whitehouse with 50 minutes on the clock. Lumsden cleverly skipped inside Kane Jellyman in the box and pulled back to his team-mate, who could only blaze over left-footed from seven yards. Three minutes later and the Brewers were in behind again, but the unpredictable playing surface didn’t help Lumsden as he attempted to find the target. It was one-way traffic and the woodwork was next to thwart the visitors as central defender Harry Coates saw a looping header flick off the top of the cross-bar. Coates was causing problems from set-pieces and he came even closer to his first Tadcaster goal mid-way through the second period. The former Hyde man rose highest at a corner and powered a header which looked destined for the top corner, only for young Livesey to pull off a stunning save. At the other end, Smyth saw his effort cleared off the line by Aaron Hardy but then Gresley's goalkeeper came up trumps once again, keeping out Lumsden from eight yards. With seven minutes left, Lumsden found himself in space in the penalty area, only for Livesey to make another important stop. The game's decisive goal then arrived as Gresley were awarded a second penalty five minutes from time. A sharp counter-attack led to Roper mis-timing a last-ditch challenge and with a second spot-kick awarded, Smyth again netted from 12 yards. Substitute Chris Howarth did pull one back deep into stoppage-time when volleying an effort through hands of Livesey, but the strike proved to be too little, too late.